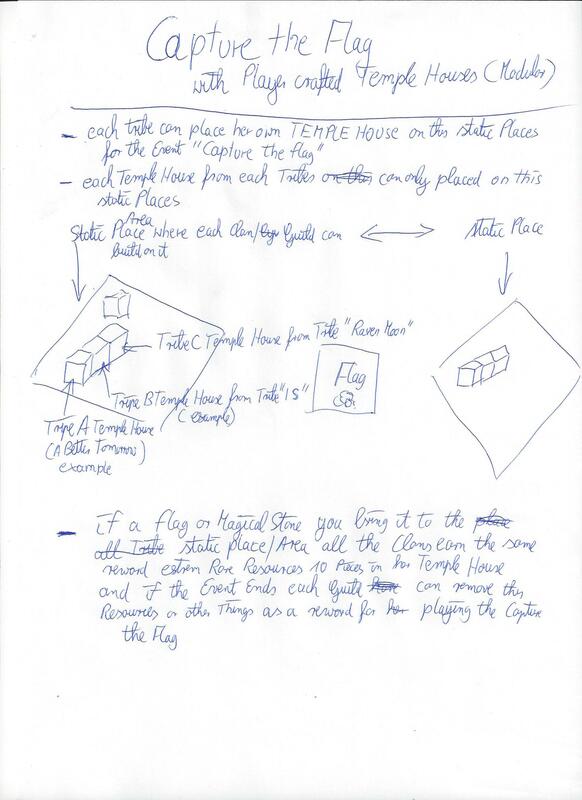 Player driven PVP "FLAG with TEMPLE HOUSE"
Thread: Player driven PVP "FLAG with TEMPLE HOUSE"
Player driven PVP "FLAG/MAGICAL STONE with TEMPLE HOUSE and STATIC AREA/OUTPOST""
I think its a nice Idea with those FLAGS for Capture the Flag in Game! Those Flags are a wonderful idea also for other events! b.) Those FLAGS/MAGICAL STONES (from the planned CAPTURE THE FLAG Events) the GM can now also place it around the world on nice places STATIC AREAS/OUTPOST (with dangeruos NPC animals or epic REVENANTS in the inner core with HUMAN BONES)or as a RANDOM SPAWN IN THE WORLD! I think many many players on the PVE or PVP Server are now wanted play those EVENTS or found those FLAGS in the wilderness to earn extrem rare random resources or random BOOKS! Last edited by Whorlok; 01-11-2015 at 04:08 AM. Last edited by Whorlok; 01-11-2015 at 02:56 AM. EVENT "CAPTURE THE FLAG" with player crafted TEMPLE HOUSES which each tribe can build on this STATIC AREAS/ZONES! -Each tribe who wanted play a CAPTURE THE FLAG Event can build on this two static areas if the STARTING TIMER is open! - When the STARTING TIMER is open all the PLAYER/TRIBES can build her MODULAR TEMPLE HOUSE and play now for this STATIC AREA SIDE! Last edited by Whorlok; 01-11-2015 at 03:31 AM. The next IDEA for Player driven LIVING WORLD is to found random spawned MAGICAL STONES and can stack it to 500? pieces and can travel then to the STARTING CITY FOUNDERS ISLAND each Saturday/or each day to same time where a GAMEMASTER/DEALER is standing as a global trader. players can now trade with GAMEMASTER and can exchange this 500 pieces MAGICAL STONE for BOOKS/RESOURCES/RECIPES/WEAPON/ARMOR and so on! BUT...ITS DANGER TO TRAVEL ALLONE! !...ENEMYS are waiting and can loot you if you die!! This idea with the 3D Models is for PVE SERVER and PVP Server!